Valkyrie card | Clash Royale fan-site! Valkyrie is one of the rare cards in Clash Royale that costs 4 drops of elixir. This is a melee, area damage troop with high hitpoints and moderate damage power. After getting onto arena this card turns into а red-haired lady with a big double-bladed battle-axe with the help of which she damages all enemy troops around her in a 360-degree area. Like all other rare cards in Clash Royale, Valkyrie has 11 levels. Each upgrade increases unit’s hitpoints and damage power. Valkyrie is a unit, which can damage only ground troops. According to this, she is very effective in defense against hordes of units with low hitpoints such as Skeleton Army, Goblin Gang, Goblins, etc. – All ground hordes of troops with low and moderate hitpoints such as Spear Goblins, Skeleton Army, Barbarian, etc. – All ground characters who are buildings orientated (Golem, Giant, Hog Rider, etc.). 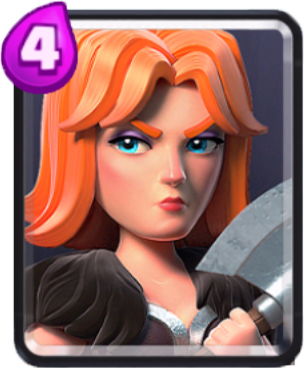 Valkyrie is also very effective against such cards as Witch, Night Witch, Wizard, Ice Wizard and other characters with moderate hitpoints and middle range of fire. However, there is an important moment. Valkyrie must be dropped directly into the enemy. In other case, she would be destroyed on her way. Valkyrie is almost useless if to use her alone against characters with huge hitpoints and damage power (P.E.K.K.A., Sparky, etc.). She’s also vulnerable against all flying units. – Vulnerability against air troops. Hog Rider. If to place the hog rider behind the valkyrie, he will push her directly to the tower due to his higher speed of movement. In such combination, the axe-lady is a great defense for the hog rider from the Skeleton Army and Goblin Gang. Wizard. Valkyrie and Wizard is a very decent combo due to wiz’s ability to attack both ground and air targets. The necessary condition is to place the wiz behind the lady. Musketeer (or Tree Musketeers). The same principle as in case with Wizard. Prince. The same principle as in case with Hog Rider. Prince, due to his higher speed, pushes Valkyrie to the enemy tower. Giant, P.E.K.K.A., Golem, Royal Giant, etc. In combination with any of these cards, Valkyrie is a kind of shield against swarms of opponent’s troops with low hitpoints. There is another unit in Clash Royale that can cause 360-degree area damage except of Valkyrie. This unit is Dark Prince.